"Draymond" redirects here. For the soccer player, see Draymond Washington. 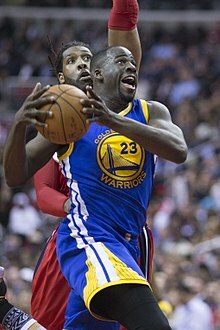 Draymond Jamal Green Sr. (born March 4, 1990) is an American professional basketball player for the Golden State Warriors of the National Basketball Association (NBA). Green, who plays primarily at the power forward position, is a three-time NBA champion and a three-time NBA All-Star. In 2017, he won the NBA Defensive Player of the Year. Green grew up in Saginaw, Michigan, and played college basketball for Michigan State, where he helped the Spartans earn two Final Four appearances and a Big Ten Tournament championship in 2012. Throughout his four-year college career, Green earned conference and national honors, including Big Ten Conference Sixth Man of the Year as a sophomore, and consensus All-American and NABC National Player of the Year honors as a senior. He went on to be drafted 35th overall in the 2012 NBA draft by the Golden State Warriors, and later played a key role on the Warriors' 2015, 2017 and 2018 championship teams. Green, who often plays significant minutes for the Warriors as an undersized center in their Death Lineup, has been cited as one of the leaders in an emerging trend in the NBA of versatile frontcourt players capable of playing and defending multiple positions, making plays for teammates and spacing the floor. Green attended Saginaw High School in Saginaw, Michigan, where he played for coach Lou Dawkins. As a sophomore in 2005–06, he averaged 12 points and 11 rebounds per game. As a junior in 2006–07, he averaged 25 points, 13 rebounds, three assists and three steals per game as he led Saginaw to the Class A State Championship and a 26–1 record. On November 14, 2007, Green signed a National Letter of Intent to play college basketball for Michigan State. Green had also considered signing with Michigan and Kentucky. As a senior in 2007–08, Green averaged 20 points, 13 rebounds, and two blocked shots per game in leading the Saginaw High Trojans to a 27–1 record, a No. 4 national ranking by USA Today and a Class A State Championship for a second straight year. He was subsequently named captain of the Detroit Free Press All-State Dream Team, and was rated the No. 36 player in the ESPN 150, including the No. 13 power forward. "2008 Michigan St. Basketball Commitment List". Rivals.com. Retrieved August 18, 2013. "2008 Michigan State College Basketball Team Recruiting Prospects". Scout.com. Retrieved August 18, 2013. "Michigan State Spartans 2008 Player Commits". ESPN.com. Retrieved August 18, 2013. "Scout.com Team Recruiting Rankings". Scout.com. Retrieved August 18, 2013. "2008 Team Ranking". Rivals.com. Retrieved August 18, 2013. As a freshman for Michigan State in 2008–09, Green appeared in 37 games off the Spartan bench as he averaged 3.3 points and 3.3 rebounds per game on the season. During Michigan State's 2009 NCAA tournament run to the championship game, Green improved to average 8.5 points and 5.3 rebounds, ranking fourth on the squad in scoring and second in rebounding while shooting a team-best .679 from the field in the tournament. As a sophomore in 2009–10, Green appeared in 37 games with three starting assignments as he averaged 9.9 points, 7.7 rebounds, 3.0 assists and 1.2 steals per game. He became the first player in Michigan State history to be named Big Ten Sixth Man of the Year, winning the award by unanimous vote. He also earned third-team All-Big Ten honors and was the recipient of MSU's Most Improved Player, Chairman of the Boards and Antonio Smith Glue and Guts awards. Twice, Green scored a season-high 19 points, on December 10 against Oakland and December 30 against Texas–Arlington. He also had seven games with double-doubles, including 17 points and 16 rebounds on February 6 against Illinois. As a junior in 2010–11, Green averaged 12.6 points and 8.6 rebounds per game. On February 10, 2011, Green followed Charlie Bell and Magic Johnson to be the third Michigan State men's basketball player to record a triple-double. In the 2011 NCAA Men's Division I Basketball Tournament, he recorded his second triple-double of the season and the seventh in NCAA tournament history in the loss against UCLA. He went on to earn third-team All-Big Ten honors for the second straight year. As a senior in 2011–12, Green captained the Spartans to a regular season Big Ten championship and Big Ten Tournament championship. The 2011–12 squad compiled a regular season 24–7 record and a 13–5 mark in Big Ten play, good for the team's 13th conference title and the third in the previous four years. Green was named Big Ten Men's Basketball Player of the week four times during the season; no other Spartan in history has won the award more than three times in a single season. On March 5, 2012, Green was named Big Ten Player of the Year by the coaches and media and was a unanimous first-team All-Big Ten selection. On March 10, 2012, Draymond passed Johnny Green as the second all-time rebounding leader at MSU, finishing the game with 1,046 career rebounds. On March 16, 2012, Green recorded his third career triple-double against LIU-Brooklyn in the second round of the 2012 NCAA Tournament and joined Oscar Robertson and Magic Johnson as just the third player in NCAA history to have two career triple-doubles in the NCAA tournament. On March 22, 2012, in a loss to Louisville, Green collected 16 rebounds, bringing him to 1,096 career rebounds, the most in Michigan State history ahead of Greg Kelser. He ended his career as one of three players in Michigan State history with over 1,000 points and 1,000 rebounds. Green was selected with the 35th overall pick in the 2012 NBA draft by the Golden State Warriors. On July 30, 2012, he signed a three-year, $2.6 million contract with the Warriors. In his NBA debut in the Warriors' season opener on October 31 against the Phoenix Suns, Green played one minute, made one defensive rebound, and committed one foul. Green gradually received more playing time in subsequent games, especially in the wake of injuries to Brandon Rush and Richard Jefferson. After getting only marginal floor time at the beginning of the season, by November 22, Green was playing 15–20 minutes per game, and by December 9, as Green gained a bigger role on the team, the Warriors had won 8 of 10 games. On December 12, Green made the winning layup with 0.9 second left in the Warriors' 97–95 win over the defending champion Miami Heat. In Game 1 of the first round of the 2013 NBA Playoffs against the Denver Nuggets on April 20, Nuggets' guard Andre Miller drove around Green and made the game-winning layup in the Nuggets' 97–95 win over the Warriors. Improving on his three-point percentage and offensive performance over the course of the series, Green helped the Warriors win the first round in six games. On May 8, Green started Game 2 of the Warriors' second-round series against the San Antonio Spurs. In the Warriors' 100–91 victory, the Warriors' first victory in San Antonio since the 1996–97 season, Green started in place of Festus Ezeli. Green played 32 minutes and recorded 5 points on 2-of-8 shooting, 7 rebounds and 5 assists. The Spurs went on to win the series 4 games to 2, subsequently ending the Warriors' season and playoff run. Green lost 20 pounds in the 2013 off-season and showed improvement in three-point shooting and defense as a sophomore. On December 1, 2013, in the Warriors' 115–113 win over the Sacramento Kings, Green tipped in a missed shot by Stephen Curry to give the Warriors a 113–111 lead with 28.7 seconds left; the Kings trailed by as many as 16 in the game. 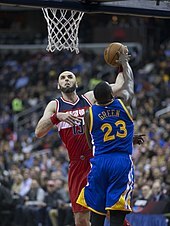 On December 25, Green was ejected from the Warriors' game against the Los Angeles Clippers for committing a flagrant 2 foul on the Clippers' forward Blake Griffin. The following day, the NBA fined Green $15,000 for "failing to leave the court in a timely manner" after being ejected. Late in the season, he filled in at power forward for injured starter David Lee, who was out indefinitely. On April 14, 2014, in the Warriors' second to last game of the regular season, Green recorded a career-high 20 points and a career high-tying 12 rebounds off the bench to help his team defeat the Minnesota Timberwolves, 130–120. Green finished the 2013–14 season having played in all 82 games with 12 starts while averaging 6.2 points and 5.0 rebounds per game. He went on to play in all seven of the Warriors' first-round playoff games against the Los Angeles Clippers, as the Warriors lost the series 4 games to 3. He earned praise for his tough defense during the series after averaging 1.7 steals and 1.7 blocks per game. With the Warriors' resurgence in 2014–15, along with it came the breakthrough the Warriors were hoping for from Green. With David Lee out of the Warriors' lineup with a hamstring injury to begin the season, Green was promoted to the starting lineup as his replacement at power forward. Over the first seven games of the season, Green averaged 13.6 points per game as the Warriors fell to a 5–2 record after losing two games in a row on November 9 and 11. In response to the two-game losing streak, the Warriors went on a 16-game winning streak with the help of Green as he averaged 13.3 points per game over the streak, including a career-high 31 points on December 6 in a 112–102 win over the Chicago Bulls. On January 2, 2015, Green recorded his first career triple-double with 16 points, 11 rebounds and 13 assists in a 126–105 win over the Toronto Raptors. He went on to finish runner-up in both the Defensive Player of the Year Award and the Most Improved Player Award. Green capped off a great season with an NBA championship and a triple-double in Game 6 of the NBA Finals, playing a center position role in place of Andrew Bogut. He became just the sixth player in NBA history to record a triple-double in an NBA Finals clinching game, joining Magic Johnson, Larry Bird, James Worthy, Tim Duncan and LeBron James. On July 9, 2015, Green re-signed with the Warriors to a five-year, $82 million contract. Green helped the Warriors record their first ever 10–0 start to a season behind averages of 11.9 points, 7.7 rebounds, a team-high 6.6 assists, 1.2 steals and 1.2 blocks per game. On November 24, he recorded 18 points and 7 rebounds in a win over the Los Angeles Lakers as the Warriors set the record for best start in NBA history at 16–0. Three days later, he recorded his third career triple-double with 14 points, 10 rebounds and 10 assists in a 135–116 win over the Phoenix Suns. His fourth career triple-double came the very next game on November 28 against the Sacramento Kings. Green had 13 points, 11 rebounds and 12 assists against the Kings, becoming the first Warriors player with back-to-back triple-doubles since Wilt Chamberlain in 1964. On December 11, Green became the first player since Nicolas Batum in 2012 to record five or more in all five major statistical categories. In just under 50 minutes of action, he recorded 24 points, 11 rebounds, 8 assists, 5 steals and 5 blocks in a 124–119 double overtime win over the Boston Celtics, increasing their unbeaten winning streak to the start the season to 24–0. The following day, the Warriors' unbeaten run was broken by the Milwaukee Bucks, losing their first game of the season 108–95 despite Green's 24-point, 11-rebound effort. On January 4, 2016, Green became the second Warriors player ever to post three straight triple-doubles (the other being Tom Gola in 1959–60) as he helped Golden State record its 35th straight regular-season home win with a 111–101 victory over the Charlotte Hornets. On January 28, he was named a Western Conference All-Star reserve for the 2016 NBA All-Star Game, earning his first All-Star selection. On March 27, he posted his franchise-best 12th triple-double of the season in a win over the Philadelphia 76ers. Three days later, in a win over the Utah Jazz, Green became the first player in NBA history to record 1,000 points, 500 rebounds, 500 assists, 100 steals and 100 blocks in a season. At the conclusion of the regular season, Green was selected to the All-NBA Second Team, finished runner-up for the Defensive Player of the Year award, and was named to the All-Defensive Team with the second-most votes. His 13 triple-doubles were second in the league to Russell Westbrook's 18, and he broke Gola's team record of nine set in 1959–60. His 13 were the most by a non-guard in the NBA since Grant Hill's 13 in 1996–97. As the No. 1 seed in the Western Conference, the Warriors eliminated the No. 8 Houston Rockets, 4–1, and advanced to the second round against Portland. In Game 1 against the Trail Blazers, Green recorded his second career postseason triple-double with 23 points, 13 rebounds and 11 assists in a 118–106 win. In Game 3 of the series, Green scored a playoff career-high 37 points in a 120–108 loss, a loss that cut the Warriors' advantage in the series to 2–1. The Warriors won the series 4–1, advancing to the Western Conference Finals against the Oklahoma City Thunder. In Game 3, Green kicked Thunder center Steven Adams in the groin. The foul was later upgraded from a Flagrant Foul 1 to a Flagrant 2 and he was fined $25,000. The Warriors went on to win the series in seven games after overcoming a 3–1 deficit. In Game 2 of the NBA Finals against the Cleveland Cavaliers, Green had 28 points with five three-pointers, seven rebounds and five assists to lead the Warriors to a 110–77 win and a 2–0 advantage in the series. Golden State went ahead 3–1 in Game 4, during which Green and LeBron James of Cleveland had to be separated. The two had gotten tangled in the closing minutes of the Warriors' 108–97 win. Green fell to the ground, and James stepped over him. Feeling disrespected, Green swung his arm and appeared to make contact with James' groin. After the game, Green was assessed a Flagrant 1 for contact that was ruled "unnecessary" and "retaliatory", and James was given a technical foul for taunting. Having accumulated his fourth flagrant foul point in the playoffs, Green was suspended for Game 5. The Warriors went on to lose the series in seven games despite a 32-point, 15-rebound effort from Green in Game 7. Green opened the season with an 18-point, 12-rebound effort against the San Antonio Spurs on October 25, 2016. He helped the Warriors start the season 14–2 before a left ankle injury sidelined him for the team's November 26 game against the Minnesota Timberwolves. He missed just the one game, and on December 1, he had a season-best game with 20 points, 15 rebounds and nine assists in a 132–127 double overtime loss to the Houston Rockets. On December 13, he recorded his 15th career triple-double with 12 points, 12 rebounds and 10 assists, along with four steals, in a 113–109 win over the New Orleans Pelicans. On January 2, he recorded his second triple-double of the season with 15 points, 10 rebounds and 13 assists in a 127–119 win over the Denver Nuggets. On January 16, he recorded his third triple-double of the season with 11 points, 13 rebounds and 11 assists, while also equaling his career best with five blocks, in a 126–91 win over the Cleveland Cavaliers. On January 26, he was named a Western Conference All-Star reserve for the 2017 NBA All-Star Game. On February 10, 2017, Green scored only four points but finished with 12 rebounds, 10 assists and 10 steals as the Warriors defeated the Memphis Grizzlies 122–107. His triple-double was the first in NBA history with fewer than 10 points scored. It also was only the second in NBA history with at least 10 rebounds, 10 assists and 10 steals in a game—the first was Alvin Robertson's in 1986, when he also had 20 points. Green became the first player in NBA history to record 10 steals and five blocks in a game since the 1973–74 season, when those became official statistics. The 10 steals also set a Warriors record and was the first 10-steal game in the NBA since Brandon Roy's in January 2009. On March 14, 2017, he had 20 points with 11 free throws, eight assists, eight rebounds and six blocks in a 106–104 win over the Philadelphia 76ers. Green became the 11th player in franchise history with 400 blocked shots, moving past Andrew Bogut for 10th place on the franchise list. Ten days later, he scored a season-high 23 points in a 114–100 win over the Sacramento Kings. On March 31 against Houston, Green became the first Warriors player ever with 150 steals and 100 blocks in a season, and the first in the NBA to do so since Dwyane Wade in 2008–09. On April 2, Green had his 19th career triple-double and fifth of the season with 11 points, 13 assists and 12 rebounds in a 139–115 win over the Washington Wizards. The Warriors finished the regular season with a 67–15 record and entered the playoffs as the No. 1 seed. On April 16, 2017, Green had 19 points, 12 rebounds, nine assists, five blocked shots and three steals in a 121–109 win over the Portland Trail Blazers in Game 1 of their first-round playoff series. The Warriors went on to sweep both the first and second rounds of the playoffs, as Green posted his third career postseason triple-double with 17 points, 10 rebounds and 11 assists in Game 4 of their second-round series against the Utah Jazz. The Warriors also swept the San Antonio Spurs in the Western Conference Finals to advance to the NBA Finals for the third straight season while becoming the first team in NBA history to go 12–0 in the playoffs. Green helped the Warriors win their second championship in three years with a 4–1 series win over the Cleveland Cavaliers in the 2017 NBA Finals. At the end-of-season awards night, Green was named the NBA Defensive Player of the Year, becoming the first player in Warriors history to earn the award. In the Warriors' season opener against the Houston Rockets on October 17, 2017, Green exited in the second half with a strained left knee after he contributed nine points, 13 assists and 11 rebounds. The Warriors went on to lose 122–121. On December 25, 2017, he had 12 points, 12 rebounds and 11 assists in a 99–92 win over the Cleveland Cavaliers, tying the franchise career record with his 20th triple-double. Four days later, he had eight points, 11 rebounds and tied his career high with 16 assists in a 111–100 loss to the Charlotte Hornets. On January 4, 2018, in a 124–114 win over the Houston Rockets, Green recorded 17 points, 14 rebounds and 10 assists to become the franchise career leader in triple-doubles with 21, passing Tom Gola. Four days later, he recorded a season-high 23 points and 10 assists in a 124–114 win over the Denver Nuggets. On January 20, 2018, he recorded 21 points and seven rebounds in a 116–108 loss to the Houston Rockets, thus surpassing the 4,000-point mark (4,019) while also reaching 3,000 career rebounds. 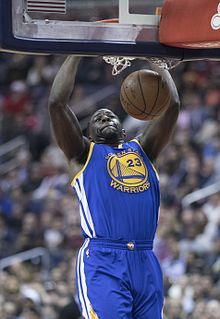 On February 24, 2018, in a 112–80 win over the Oklahoma City Thunder, Green passed Chris Mullin (488) for eighth place on the Warriors' blocked shots list. On March 8, 2018, he had his third triple-double of the season with 11 points, 12 rebounds and 10 assists in a 110–107 win over the San Antonio Spurs. Green helped the Warriors defeat the Spurs in the first round of the playoffs in five games, as he recorded 17 points, a career-playoff high 19 rebounds and seven assists in a 99–91 win in Game 5. In Game 1 of the Warriors' second-round series against the New Orleans Pelicans, Green recorded his fourth career postseason triple-double with 16 points, 15 rebounds, 11 assists, three steals and two blocks in a 123–101 win. He topped Gola's three playoff triple-doubles for most in franchise history. In Game 4, Green had eight points, nine rebounds, nine assists, four steals and two blocks in a 118–92 win. With his fourth rebound, Green became the third player in Warriors history to reach 800 playoff rebounds, joining Wilt Chamberlain (922) and Nate Thurmond (896). In Game 7 of the Western Conference Finals, Green had 10 points, 13 rebounds and five assists, as the Warriors earned a fourth straight trip to the NBA Finals by beating the Rockets 101–92. In Game 3 of the 2018 NBA Finals, Green passed Chamberlain for the most rebounds in Warriors playoff history. The Warriors went on to sweep the series against the Cavaliers to claim back-to-back titles. After being limited during the preseason by a sore knee, Green played unhindered over the first 10 games of the season. On November 5 against the Memphis Grizzlies, Green was limited to just under 14 minutes because of a bruised right foot. He subsequently missed the next two games because of a sprained right toe. He returned to action on November 12 against the Los Angeles Clippers, but a heated argument between himself and teammate Kevin Durant during and after the game led to Green being suspended for the Warriors' contest the following day against the Atlanta Hawks. He played on November 15 against the Houston Rockets, but then missed the next 11 games with the same sprained toe on his right foot. In his return game on December 10, he had seven points, 10 rebounds and seven assists in a 116–108 win over the Minnesota Timberwolves. On January 24, he grabbed a season-high 15 rebounds in a 126–118 win over the Washington Wizards. Green represented the United States national team at the 2011 Summer Universiade men's basketball tournament in Shenzhen, China. Team USA finished in fifth place in the tournament as Green averaged 8.6 points and 6.0 rebounds with a 46.3% shooting percentage. In June 2016, Green was named in the United States national squad for the 2016 Summer Olympics. He helped Team USA win the gold medal in Rio, and in eight games, he averaged 1.9 points, 2.1 rebounds and 1.2 assists per game. Though he is considered undersized for a power forward at 6 feet 7 inches (2.01 m), Green is a versatile defender, capable of guarding all 5 positions as both an interior and perimeter defender. Green studies opponents' habits, and leverages his preparation along with his muscular frame and lower-body strength, and is capable of generating rebounds, steals and blocks. He has been named to multiple NBA All-Defensive Teams, and was named the 2016-17 NBA Defensive Player of the Year. Offensively, he can handle the ball on fast breaks and deliver passes to his teammates for scores. He is a capable three-point shooter who provides spacing for the offense by stretching the opposing defense. Green is also adept at scoring around the basket. His outstanding interior defense combined with his offensive repertoire form a unique two-way skill set. Under the coaching of Steve Kerr (and Luke Walton under a temporary basis), Green became crucial to the Warriors' Death Lineup as the team's center. His performance in this position enabled the Warriors to create a number of match-up problems for opposing defenses during the 2014–15 and 2015–16 seasons. When played as a center, Green's length and strength allow him to credibly defend and contest opposing centers in the post, though he does give up some rebounding ability against taller opponents. On the offensive side, however, he can outrun, out-pass and outmaneuver most other centers in the league, leading to fast-break opportunities and disrupting defensive sets. This versatility and efficiency at the position has resulted in many analysts discussing Green as embodying the future direction of the center position in the NBA, with some even calling him the league's best center. During the 2015–16 season, Green dramatically increased his play-making role on the team, doubling his assists average to a team-leading 7.4 per game—good for seventh in the league and by far the most assists by any power forward that year. Green's ball handling, court vision and unselfishness in a point forward role have been repeatedly cited as a reason why the Warriors improved from 2014-15 to 2015-16. In 2015-16, Green played approximately 20 percent of his minutes in that role, with the Warriors outscoring their appointments by 26.6 points per 48 minutes. Though he took a lesser role on offense for the 2016-17 season, thanks to the addition of former MVP Kevin Durant, he took a step forward on defense, finally winning the NBA Defensive Player of the Year Award that he coveted after two straight seasons as runner-up to Kawhi Leonard. He is widely viewed as the emotional and motivational "heart and soul" of the Warriors and is noted for his vocal leadership on the court and in the locker room. As the Warriors pushed to the close of a record-setting 2015–16 season, Green was vocal about his desire to break the Chicago Bulls' all-time wins record, and sought the input of his teammates to make sure the team successfully pushed toward the goal together. Green and Curry's on-court chemistry has been cited as a key to the Warriors' improvement in 2015–16, as Green's outspoken, fiery desire has meshed with Curry's quieter, implacable confidence to give the team "dual—and at times dueling—alpha dogs" that are ultimately mutually supporting. Green is said to have played a significant role in the recruitment of Kevin Durant to join the Warriors. Because of his highly physical play, including multiple high-profile incidents of physical play in the playoffs, some have criticized him as being a 'dirty' player. Green is frequently among the league leaders in technical fouls. Green is the son of Mary Babers and Wallace Davis. His stepfather is Raymond Green, and he has two brothers, Torrian Harris and Braylon Green, and three sisters, LaToya Babers, Jordan Davis and Gabby Davis. Harris played basketball for Nebraska-Omaha from 2009 to 2011. Green has one child, a son Draymond Jr.
During his time at Michigan State University, Green practiced with the Michigan State Spartans football team and was in for two plays during the 2011 Green-White spring football game and played tight end. In the summer of 2012, Green moved into an apartment in Emeryville, California. Green considered it too expensive to live in San Francisco as most of his Warriors teammates did and explained his choice of a modest apartment: "I've been pretty broke my entire life. I'm not going to live that same life, but I'm going to keep those same principles." He identifies himself as a Christian. On September 14, 2015, Green donated $3.1 million to Michigan State University, which is the largest pledge from an athlete in the school's history, to help build a new athletics facility and fund an endowment program for scholarships. On July 10, 2016, Green was arrested for assault in East Lansing, Michigan. The night prior, he had a confrontation with Michigan State defensive back Jermaine Edmondson. The arresting report cites Green went to Rick's bar and had bumped into Edmondson. After a verbal exchange, two associates of Green allegedly choked Edmondson and his girlfriend. The next night, both Green and Edmondson attended Conrad's Grill in East Lansing where Edmondson confronted Green about the incident the night before. Green allegedly poked Edmondson in the chest and either slapped or punched him in the face. The arresting officers stated that Green had a blood alcohol level of .10 and admitted to slapping Edmondson and asked to apologize to the victim. After posting a $200 bail, Green was released four hours after the arrest. ^ a b c d e f g h "Draymond Green Bio". msuspartans.com. Retrieved January 1, 2013. ^ "Men's Basketball Adds Impressive Recruiting Class". msuspartans.com. November 14, 2007. Retrieved December 15, 2014. ^ "Draymond Green 2008 Basketball Recruiting News". ESPN.com. Retrieved January 1, 2013. ^ Vannini, Chris (February 13, 2011). "Green's triple-double sparks Spartan win, 75–57". StateNews.com. Archived from the original on January 2, 2013. ^ "Draymond Green earns 7th triple-double". ESPN.com. March 18, 2011. Retrieved December 15, 2014. ^ "Green Earns 2nd Straight Big Ten Weekly Award". msuspartans.com. February 21, 2012. Retrieved December 15, 2014. ^ "Big Ten Announces 2012 Men's Basketball Postseason Honors". BigTen.org. March 5, 2012. Retrieved December 15, 2014. ^ "Draymond Green carries No. 8 Spartans into first Big Ten finale since 2000". ESPN.com. March 10, 2012. Retrieved December 15, 2014. ^ "Green Posts Rare NCAA Tournament Triple-Double". msuspartans.com. March 17, 2012. Retrieved December 15, 2014. ^ Couch, Graham (July 30, 2012). "Draymond Green nets 3-year, $2.6 million deal with Golden State Warriors, report says". MLive.com. Retrieved December 15, 2014. ^ "Draymond Green 2012–13 Game Log". Basketball-Reference.com. Retrieved March 24, 2013. ^ a b Simmons, Rusty (December 9, 2012). "Warriors' Green makes big contribution". SFGate.com. Retrieved January 1, 2013. ^ Thompson, Marcus II (November 22, 2012). "Warriors rookie Draymond Green earning more minutes". InisdeBayArea.com. Archived from the original on January 2, 2013. ^ "Draymond Green's layup with 0.9 seconds left lifts Warriors past Heat". ESPN.com. December 12, 2012. Retrieved December 15, 2014. ^ "Draymond Green Helps the Warriors Sink the Heat". YouTube.com. December 12, 2012. Retrieved December 15, 2014. ^ Windsor, Shawn (May 6, 2013). "Shawn Windsor: Draymond Green proving he belongs in NBA". freep.com. Retrieved May 8, 2013. ^ Thompson, Marcus II (May 6, 2013). "Warriors notebook: Draymond Green saved his best for postseason". MercuryNews.com. Retrieved May 8, 2013. ^ Simmons, Rusty (May 9, 2013). "Warriors finally win in San Antonio". San Francisco Chronicle. Retrieved May 9, 2013. ^ Bernreuter, Hugh (May 9, 2013). "Draymond Green helps lead Golden State Warriors to NBA Playoff Game 2 win over San Antonio Spurs". MLive.com. Retrieved May 9, 2013. ^ Simmons, Rusty (December 2, 2013). "For Warriors, Green's work paying off". SFGate.com. Retrieved December 29, 2013. ^ Simmons, Rusty (December 2, 2013). "Curry, Thompson help Warriors win squeaker". SFGate.com. Retrieved December 29, 2013. ^ Steward, Carl (December 25, 2013). "Golden State Warriors beat Los Angeles Clippers". InsideBayArea.com. Retrieved December 29, 2013. ^ Simmons, Rusty (December 26, 2013). "Warriors developing a reputation as pests". SFGate.com. Retrieved December 29, 2013. ^ a b Kawakami, Tim (April 8, 2014). "Kawakami: Draymond Green is Warriors' top power forward". The San Jose Mercury News. Archived from the original on June 15, 2015. ^ "Notebook: Warriors 130, Timberwolves 120". NBA.com. April 14, 2014. Retrieved December 15, 2014. ^ "Draymond Green 2013–14 Game Log". Basketball-Reference.com. Retrieved December 15, 2014. ^ "Draymond Green 2014–15 Game Log". Basketball-Reference.com. Retrieved December 15, 2014. ^ "Warriors beat Bulls for 12th straight win". NBA.com. December 6, 2014. Retrieved December 15, 2014. ^ "Curry, Green lead Warriors past Raptors, 126–105". NBA.com. January 2, 2015. Retrieved January 8, 2015. ^ "Spurs' Kawhi Leonard named Kia Defensive Player of the Year Award". NBA.com. April 23, 2015. Retrieved May 26, 2015. ^ "Bulls' Jimmy Butler voted as NBA's Most Improved Player". ESPN.com. May 7, 2015. Retrieved May 24, 2015. ^ "Draymond Green Tallies Big Finals Triple-Double in Win". YouTube.com. June 16, 2015. Retrieved June 16, 2015. ^ "Warriors Re-Sign Free Agent Forward Draymond Green to Multi-Year Contract". NBA.com. Turner Sports Interactive, Inc. July 9, 2015. Retrieved July 9, 2015. ^ ESPN news services (July 2, 2015). "Draymond Green announces he's re-signing with Golden State Warriors". espn.go.com. Retrieved July 2, 2015. ^ "Draymond Green 2015-16 Game Log - Basketball-Reference.com". basketball-reference.com. Retrieved January 27, 2017. ^ "Warriors vs Suns". nba.com. Retrieved January 27, 2017. ^ "Kings vs Warriors". nba.com. Retrieved January 27, 2017. ^ "Warriors vs Celtics". nba.com. Retrieved January 27, 2017. ^ "Warriors vs Bucks". nba.com. Retrieved January 27, 2017. ^ "Hornets vs Warriors". nba.com. Retrieved January 27, 2017. ^ "Draymond Green and Klay Thompson Named to 2016 Western Conference All-Star Team - Golden State Warriors". nba.com. Retrieved January 27, 2017. ^ "76ers vs Warriors". nba.com. Retrieved January 27, 2017. ^ "Warriors PR on Twitter". twitter.com. Retrieved January 27, 2017. ^ "Warriors' Stephen Curry and Cavaliers' LeBron James headline 2015–16 All-NBA First Team". NBA.com. May 26, 2016. Retrieved June 7, 2016. ^ "Spurs' Leonard named Kia Defensive Player of the Year". NBA.com. April 18, 2016. Retrieved June 7, 2016. ^ "Spurs' Kawhi Leonard unanimously selected to 2015–16 NBA All-Defensive First Team". NBA.com. May 25, 2016. Retrieved June 7, 2016. ^ Tafur, Vic (May 20, 2016). "Russell Westbrook, Draymond Green masters of the triple-double". San Francisco Chronicle. Archived from the original on June 12, 2016. ^ "Trail Blazers vs Warriors". nba.com. Retrieved January 27, 2017. ^ "Warriors vs Trail Blazers". nba.com. Retrieved January 27, 2017. ^ "NBA upgrades Green foul to flagrant 2, fines him $25,000". NBA.com. May 23, 2016. Retrieved May 23, 2016. ^ "Cavaliers vs Warriors". nba.com. Retrieved January 27, 2017. ^ Leung, Diamond (June 12, 2016). "NBA Finals: Warriors' Draymond Green suspended for Game 5 by NBA". The Mercury News. Archived from the original on June 12, 2016. ^ "Leonard, Spurs spoil Durant's Warriors debut with blowout". ESPN.com. October 25, 2016. Retrieved November 27, 2016. ^ "Draymond Green 2016–17 Game Log". Basketball-Reference.com. Retrieved December 13, 2016. ^ "Curry scores 30, Warriors edge Pelicans 113–109". ESPN.com. December 13, 2016. Retrieved December 13, 2016. ^ "Draymond Green triple-double leads Golden State past Denver". ESPN.com. January 2, 2016. Retrieved January 3, 2017. ^ "Warriors rout defending champion Cavaliers 126–91 in rematch". ESPN.com. January 16, 2016. Retrieved January 17, 2017. ^ "Warriors hold off Sixers 106-104 to snap three-game skid". ESPN.com. March 14, 2017. Retrieved March 15, 2017. ^ "Warriors use big fourth quarter to hold off Rockets 107-98". ESPN.com. March 31, 2017. Retrieved April 1, 2017. ^ "Curry shines against Wizards, Warriors win 11th straight". ESPN.com. April 2, 2017. Retrieved April 2, 2017. ^ "Durant shines in Warriors playoff debut in Game 1 win". ESPN.com. April 16, 2017. Retrieved April 16, 2017. ^ Slater, Anthony (May 22, 2017). "Warriors smash Spurs to win West crown, improve to NBA record 12-0 in playoffs". MercuryNews.com. Retrieved May 24, 2017. ^ "Draymond Green Named 2016-17 Kia NBA Defensive Player of the Year". NBA.com. June 26, 2017. Retrieved June 27, 2017. ^ "Howard leads Hornets past Warriors". ESPN.com. December 29, 2017. Retrieved December 29, 2017. ^ "Curry, Thompson help Warriors beat Rockets 124-114". ESPN.com. January 4, 2018. Retrieved January 4, 2018. ^ "Paul has 33, Rockets end Warriors' streak with 116-108 win". ESPN.com. January 20, 2018. Retrieved January 20, 2018. ^ "Warriors use big second quarter to pull away, rout Pelicans". ESPN.com. April 28, 2018. Retrieved April 29, 2018. ^ "Durant's scores 38, Warriors down Pelicans for 3-1 lead". ESPN.com. May 6, 2018. Retrieved May 6, 2018. ^ "Curry, Durant lead Warriors past Thunder in festive opener". ESPN.com. October 16, 2018. Retrieved October 17, 2018. ^ a b "Draymond Green 2018-19 Game Log". Basketball-Reference.com. Retrieved December 3, 2018. ^ "Warriors use big third quarter to beat Grizzlies 117-101". ESPN.com. November 5, 2018. Retrieved December 3, 2018. ^ "Durant's double-double lifts Warriors past Nets 116-100". ESPN.com. November 10, 2018. Retrieved December 3, 2018. Green missed his second straight game because of a sprained right toe. ^ "Warriors Forward Draymond Green Suspended". NBA.com. November 13, 2018. Retrieved November 14, 2018. ^ "Kevin Durant leads undermanned Warriors past Hawks 110-103". ESPN.com. November 13, 2018. Retrieved November 14, 2018. ^ "Harden scores 27 as Rockets rout Warriors 107-86". ESPN.com. November 15, 2018. Retrieved December 3, 2018. ^ "Warriors splash 19 3s to beat Bucks 105-95 on road". ESPN.com. December 7, 2018. Retrieved December 8, 2018. F Draymond Green missed his 11th straight game with a sprained right toe. ^ "Curry scores 38 to push Warriors past Timberwolves 116-108". ESPN.com. December 10, 2018. Retrieved December 11, 2018. ^ "Curry scores 38, Warriors beat Wizards for 9th straight win". ESPN.com. January 24, 2019. Retrieved January 24, 2019. ^ "Warriors' Draymond Green records one-of-a-kind triple-double with rebounds, assists and steals". NBA.com. February 10, 2017. Retrieved June 11, 2018. ^ "Draymond Green named to US Olympic men's hoops team". lansingstatejournal.com. Retrieved January 27, 2017. ^ "Draymond GREEN at the Players of the Rio 2016 - Olympic Basketball Tournament (Men) 2016 - FIBA.com". fiba.com. Retrieved January 27, 2017. ^ a b c Voisin, Ailene (May 14, 2015). "Warriors' Draymond Green shatters NBA stereotypes". The Sacramento Bee. Archived from the original on June 15, 2015. ^ a b c Feldman, Dan (May 20, 2015). "Draymond Green at center gives Warriors wrinkle necessary to beat Rockets". NBCSports.com. Archived from the original on June 15, 2015. ^ a b Pina, Michael (June 10, 2015). "Warriors Need More From Green". Sports On Earth. Archived from the original on June 15, 2015. ^ Flannery, Paul (February 16, 2016). "Draymond Green Is Redefining NBA Stardom. Even He Didn't See That Coming". SBNation.com. Retrieved March 14, 2016. ^ Pelton, Kevin (December 22, 2015). "Draymond Green is the best center in the NBA". ESPN.com. Retrieved January 12, 2016. ^ Partnow, Seth (December 22, 2015). "Warriors power forward Draymond Green is the NBA's best center". WashingtonPost.com. Retrieved January 12, 2016. ^ Winter, Jack; Lund, Spencer (November 14, 2015). "Basketball, Neat: Draymond Green's 4-On-3 Playmaking Prowess". uproxx.com. Retrieved April 10, 2016. ^ Feldman, Dan (April 7, 2016). "Draymond Green's passing unlocking new levels for Warriors' offense". NBCSports.com. Retrieved April 10, 2016. ^ "2015–16 NBA Award Picks: Steph Curry not the only unanimous winner". CBSSports.com. April 11, 2015. Retrieved April 16, 2016. ^ "Draymond Green finally wins Defensive Player of the Year". The Mercury News. June 27, 2017. Retrieved August 6, 2017. ^ Gonzalez, Antonio (January 15, 2015). "Draymond Green is the 'heart and soul' of the Warriors". Yahoo!Sports.com. Retrieved June 15, 2015. ^ Kawakami, Tim (April 10, 2016). "The Warriors' group chat: It's the players' millennial nexus, private comedy club, and how this team prepares to take on the world". MercuryNews.com. Retrieved April 10, 2016. ^ "Draymond sheds light on recruiting Durant, meeting in Hamptons". NBCS Bay Area. July 4, 2016. Retrieved August 6, 2017. ^ http://www.facebook.com/des.bieler. "Draymond Green says he doesn't 'do dirty things' — proceeds to kick Kyrie Irving". Washington Post. Retrieved August 6, 2017. ^ "Where do Draymond Green, Kelly Olynyk and Zaza Pachulia rank among the dirtiest players in the NBA?". cleveland.com. Retrieved August 6, 2017. ^ "Draymond Green responds to being called a dirty player | FOX Sports". FOX Sports. December 2, 2016. Retrieved August 6, 2017. ^ "Draymond Green Isn't Dirty, He's Misunderstood". Complex. Retrieved August 6, 2017. ^ Powell, Shaun. "Draymond Green walking the fine line to redemption for Golden State Warriors". NBA.com. Retrieved August 6, 2017. ^ "Warriors' Draymond Green: Last year's Finals suspension 'woke me up'". USA TODAY. Retrieved August 6, 2017. ^ "Draymond Green Stats, Video, Bio, Profile". NBA.com. Archived from the original on November 14, 2014. Retrieved December 15, 2014. ^ "Warriors' Draymond Green out Thursday after birth of son". ESPN.com. December 22, 2016. Retrieved December 22, 2016. ^ "Look: Draymond Green Shares Some New Pictures of His Baby Son and the Boy Is Too Cute". bet.com. December 28, 2016. Retrieved August 4, 2018. ^ Bernreuter, Hugh (June 23, 2011). "Draymond Green gives football a shot, but will stick with Michigan State basketball". MLive.com. Retrieved April 12, 2016. ^ Simmons, Rusty (October 4, 2012). "Warriors rookie seems down to Earth". SFGate.com. Retrieved January 1, 2013. ^ "Expressions of Faith". YouTube.com. July 18, 2013. Retrieved December 15, 2014. ^ Sherwood Strauss, Ethan. "Draymond Green pledges $3.1M to Michigan State for athletics, academics". espn.com. ESPN. Retrieved September 14, 2015. ^ Rexrode, Joe. "Draymond Green donates $3.1 million to MSU athletics". freepress.com. Detroit Free Press. Retrieved September 14, 2015. ^ ESPN News Services (July 11, 2016). "Draymond Green faces assault charges in Michigan". ESPN.com. Retrieved July 11, 2016. ^ Perez, AJ (July 11, 2016). "Draymond Green arrested on suspicion of assault". USA TODAY. Retrieved July 11, 2016. ^ Quinn, Brendan (July 11, 2016). "Draymond Green arrested for assault in East Lansing". Michigan Live. Retrieved July 11, 2016. ^ Rohrbach, Ben (July 14, 2016). "Draymond Green's alleged victim tells police he was choked, punched". Yahoo.com. Retrieved July 14, 2016. 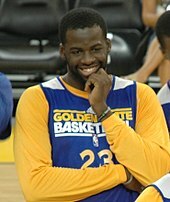 Wikimedia Commons has media related to Draymond Green.